“The best one yet,” claims New York’s Will Skudin. 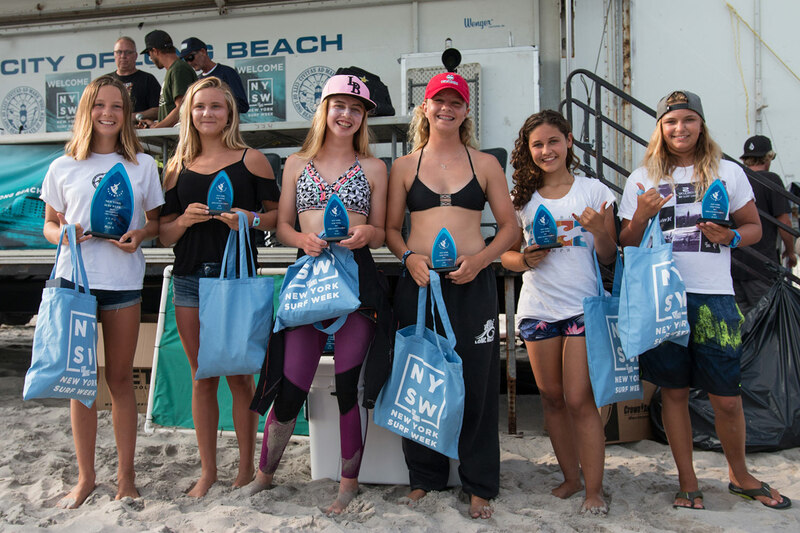 The 8th Annual NY Surf Week dedicated to George “Geeza” Gieser went off with a bang. A small groundswell all week set the tone for another jam-packed week of events. 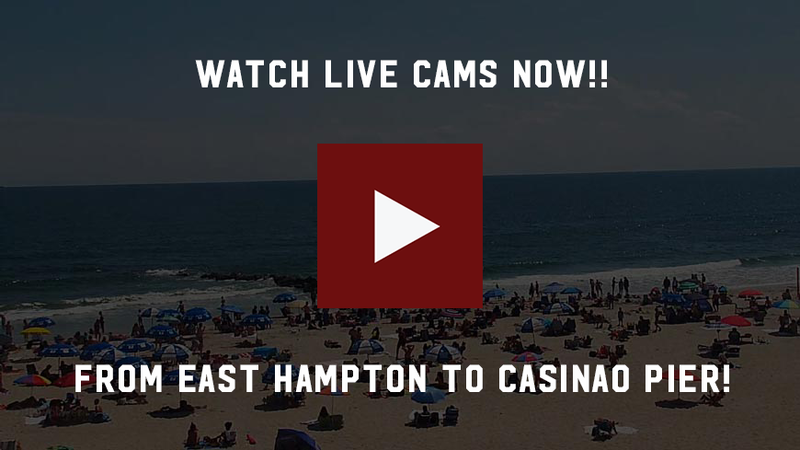 Skate contests, Vending Village, movie nights, parties and more fills the town of Long Beach, New York every year in memory of Geeza and this year was the biggest in attendance in 7 years thanks to the help form our sponsors: Yeti Coolers, Honest Tea, Essentia Water, La Colombe, Teton Gravity Research, Outside TV, Clif Bar & Skudin Surf . Not only do we know George was smiling down on us, but once again he sent us waves. “The skateboard competition was next level this year,” explains director Brian Adamkiewicz. Kids and adults alike were launching themselves onto the podium, literally. Held at the Long Beach Recreation Center we had sunny skies, more than eighty competitors, a Stoke Mobile/Teton Gravity research van, and $1K in cash prizes, trophies and giveaways. We started off with our street contest. 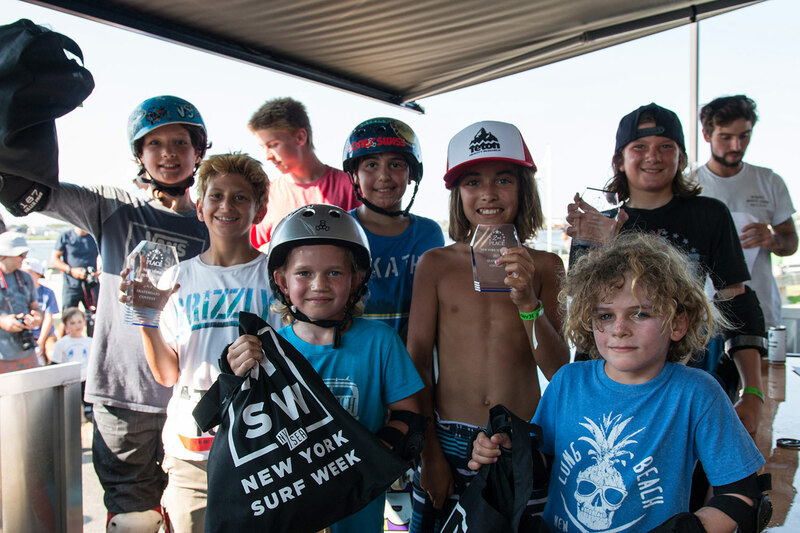 Kids from age 5-18 competed for the 1st place prize with Tim drake from Bethpage taking home 1st place with a notable backside 180 over the quarter pipe and just edging out local shredder Oscar Johnson who had extremely consistent lines around the park. Adult street’s 2016 1st place winner Brandon Johnson from the Bronx won Best Trick, landing a backside 360 nose grab from the quarter pipe over the grass all the way to the wooden boardwalk. Tyler Collins took 1st with a huge frontside flip over the A-frame rail. Nico Ramos took 2nd place with the most consistent runs in his heats and late frontside shuvit down the 4 blocks. T.J Higgins took 3rd with frontside feebles and a frontside overcook. 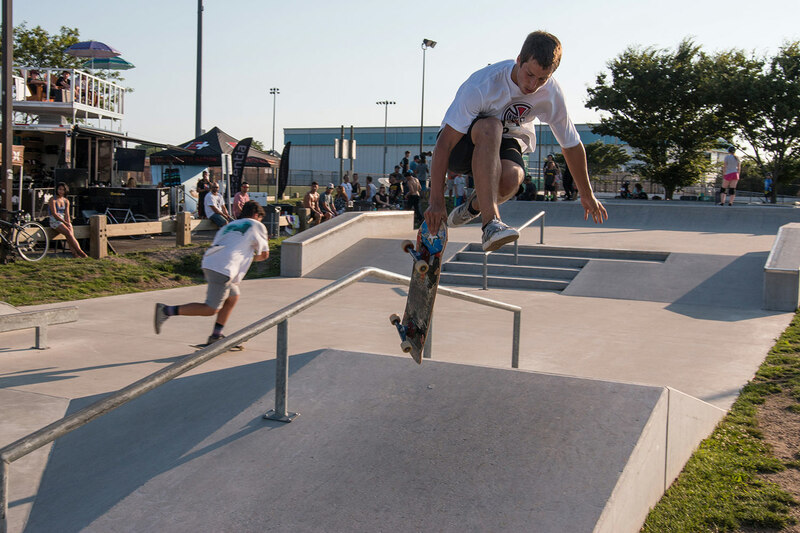 Tyler Collins skated the best that day and took home the 1st place cash prize from the Bowl jam as well. Frontside flipping over the copping landing on his bolts in the 6ft deep end of the bowl is what made him $400.00 richer that day. 2nd place was Nick McDonough with super technical variations and a mid run rock to fake-kick flip out. The best surfers in NY traded off air for air in the first ever NYSEA Expression Session. A new addition this year’s events thanks to one of our main sponsors, Yeti coolers. 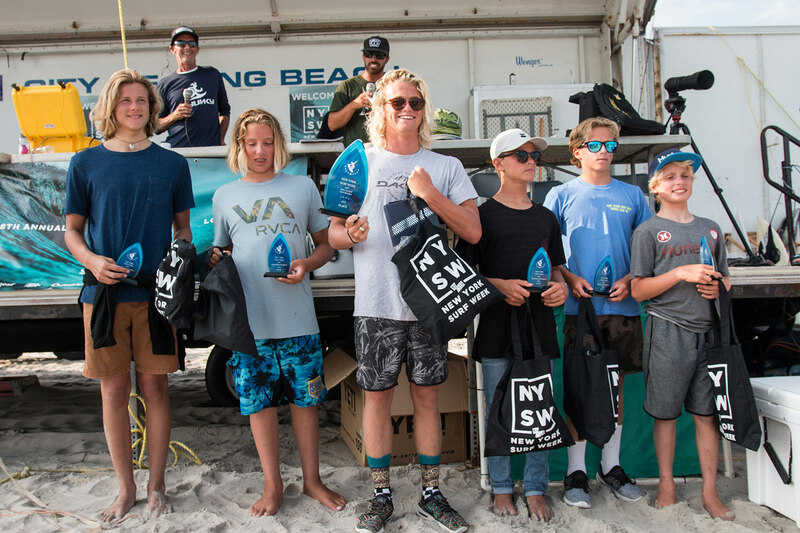 Local Pro TJ Gumiela and visiting Pro Logan Hayes went home with the cash. After all the fun during the day, the nights were almost as highly anticipated. 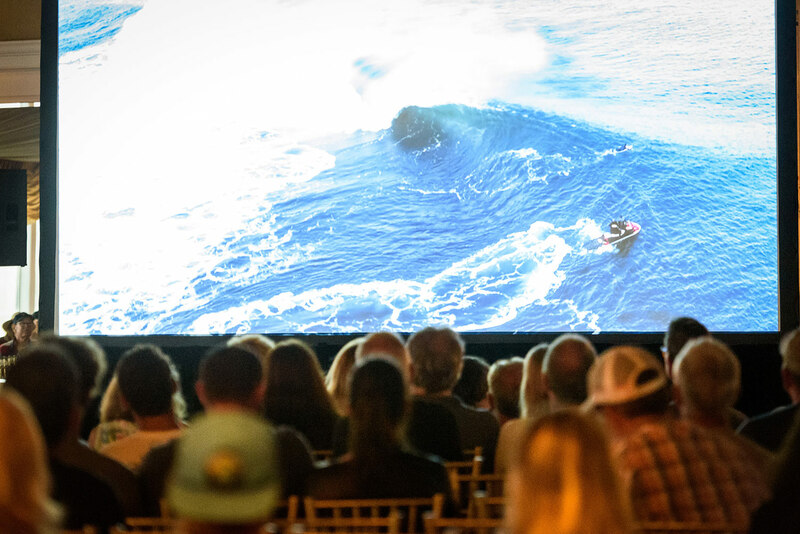 Movie night at Bridgeview Yacht Club presented by Hurley Surf Club premiered two epic films, and featured a chance to put down the star of the movie Will Skudin in the dunk tank. 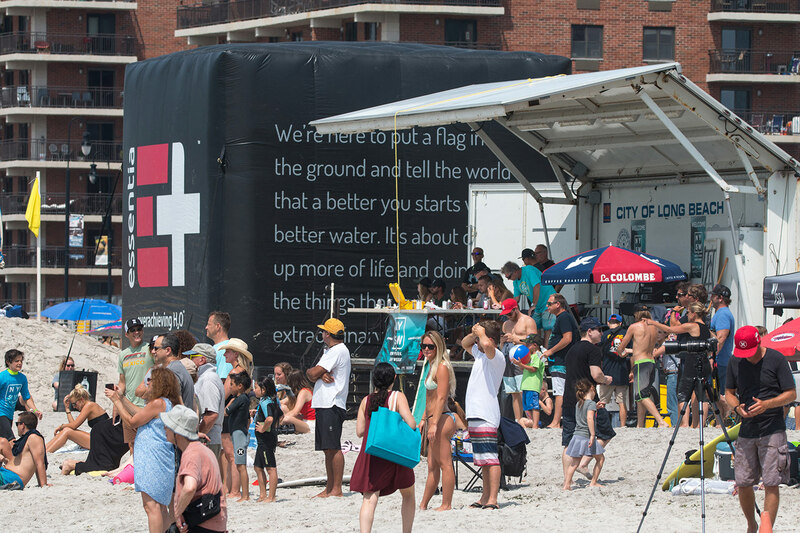 “Hurley Surf Club was started to bring the community of surfers together whether it be at the beach, coffee shop, local barbecue or at events like this. 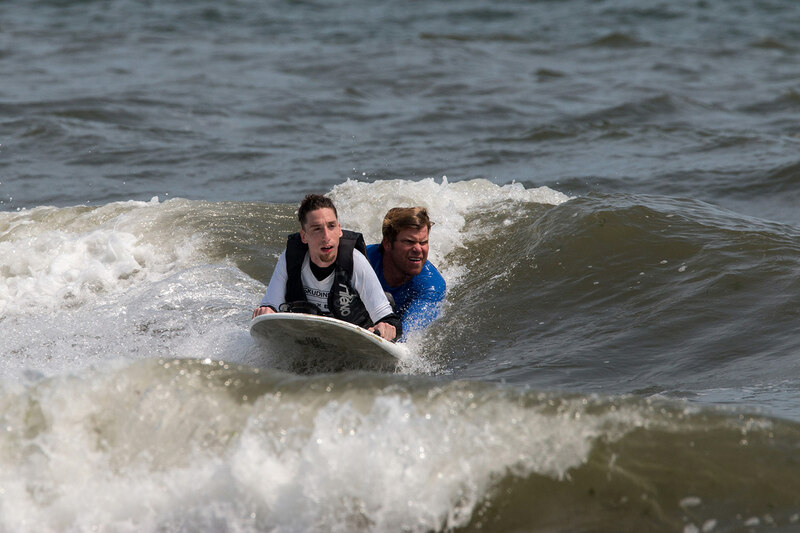 What better event for us to come forward and support than this awesome movie night in celebration of New York Surfing,” says Chris Hamlet of the Hurley Surf Club. After the groms drenched Will a few times, friends and families settled in for the premiere of both “Green Means Go” by Jason Belsky and Will Skudin and “Time & Tide” by Drew Maloney. Awesome raffle prizes, free pizza from Gino’s New York and popcorn kept everyone entertained between films, and it would be safe to say everyone left stoked. which would lead us to the NYSEA OPEN. This contest is set up in the same format as a world championship event with numbers on the backs of the jerseys and last year’s champion Leif Engstrom holding down the yellow jersey (as seen in the world surf league). With Man-on-Man format it was a 10-hour day. Local underdog and Hurley Surf Club manager Chris Hamlet fell just short of the final and ended with a veryrespectful equal 3rd place. Semi final two put Rob Kelly up against Leif Engstrom, the rail game versus the air game. Leif landed a couple of big rotations to start off the heat, but Rob ended up pushing his rail game past the semi and into the final. The final boiled down New Jersey’s Rob Kelly against Puerto Rico’s Bryan Laide. Bryan was flying at a different speed than all his other competitors throughout the day. The boys went blow for blow, keeping their boards in the water and focusing on the vertical surfing that got them to the final. 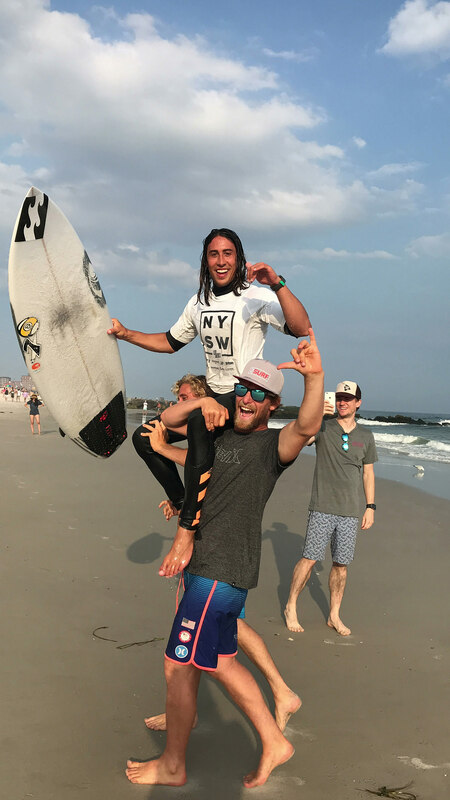 In the dying minutes Rob edged out Bryan and was carried up the beach as our new, NYSEA OPEN New York Surf Week Champion! Major thank you to all of our sponsors: Yeti Coolers, Honest Tea, Essential Water, Clifbar, Teton Gravity, Outside TV, La Colombe Coffee, Hurley Surf Club, Skudin Surf Jonathan Tand and Associates & the Gnarmads. 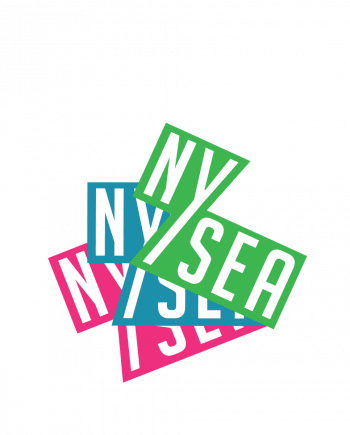 “On behalf of NYSEA and everyone involved in this years NY Surf Week, we would like to thank everyone for all your support and participation over the years. This has definitely been the best one yet,” – Will Skudin.